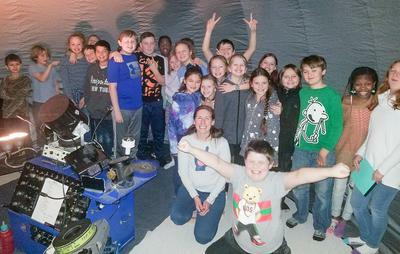 Blue Hill Consolidated School students experienced the nighttime sky, and learned the legends and science surrounding the sky, stars and space, on January 15, when Northern Stars Planetarium visited with its inflatable planetarium for a day-long program for first graders through sixth graders. The program was funded by a grant from BHCS Boosters. The lights dim and music swells in the portable planetarium covering much of the Blue Hill Consolidated School cafeteria floor early on Tuesday, January 15. Faces of third and fourth graders tilt up to the “sky” as Northern Stars Planetarium’s John Meader tells first the Native American Cheyenne tale of how the earth came to be. (It is perched on the shell of a giant turtle.) Then comes a Hopi story of how the stars came to be. A bright flash of light and then stars appear in the sky. Northern Stars brought a day of space and stars to the school with a BHCS Boosters grant applied for by fifth grade teacher Caitlin Snyder. From myths, stories and legends to parsing the differences between comets, asteroids and meteors, and a presentation on exactly what stars are and how they work, students from nearly all grades kicked off their shoes, crawled through the entrance tunnel, and entered the nighttime sky for a different kind of classroom experience. BHCS Boosters, a 501(C)(3) nonprofit corporation that develops resources to support educational enrichment at BHCS, encourages the K-8 school staff to think about ways to bring “unique and innovative activities” to students, Young said.